I am beginning a series of analysis now based on the Ichimoku system. Yesterday I was talking about how prices in most of the majors (BTC, LTC, ETH, and BCH) have entered consolidation zones and ‘squeezes’ on their charts. 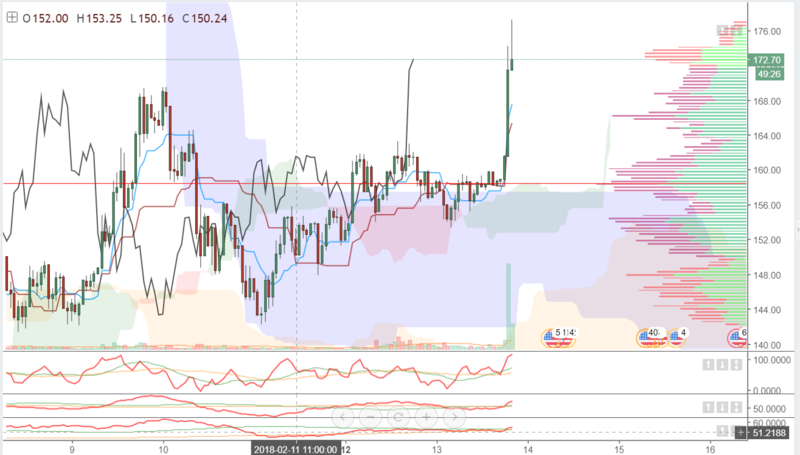 Specifically, Bitcoin was trading slightly above its 1 hour and 4-hour cloud but was inside the area of the 8 hours. Litecoin though has emerged the leader here. If observe the clouds on the chart, we can see three of them. The blue is an 8-hour cloud, the orange/yellow is the 4-hour cloud and the red/green is the 1-hour cloud. A bullish indication that price was going to accelerate and move to the upside was price sitting on top of all these clouds. We were in a very tight squeeze and it was indicative of pressure building and price coiling to give us a nice breakout to the top. So what does this mean for Bitcoin and Ethereum? A lot. Tons. It’s crazy important. Litecoin, Ethereum, and Bitcoin all tend to move together in structure. While they do sometimes break away from one another and sometimes lag in their moves, for the most part, they have very correlative movements. But as exciting as this move is, we want to make sure it is an honest move. The volume on this move was just massive. It’s one of the largest volume bars in the history of LTC. But price did stop at a historical resistance area, so we’ll want to see if there is some strong follow-through buying to push it above. We also want to see if Ethereum and Bitcoin will follow suit. So a lot of this move is going to be waiting for a confirmatory move on both Bitcoin and Ethereum and then a break of this resistance level.